I’ve not really eaten gooseberries much. I’d never had one raw before, and had only rarely tasted them in desserts such as gooseberry fool. And I’d not been too enamoured with them on those occasions. Pete’s always been a fan, though. We inherited a few bushes on our allotment, though they didn’t produce any fruit last year. We figured that could be down to a lack of pruning for the last few years, and Pete pruned them hard last autumn. It worked, and this year I picked berries from three bushes, a mix of smooth red dessert ones and hairy green ones. I tasted a dark red one whilst picking and, whilst I can’t say they’ll become a favourite fruit for me, it was alright! 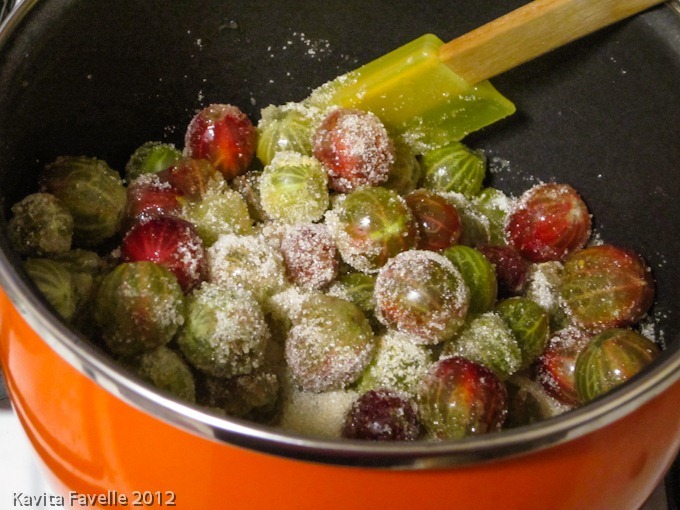 I’d never prepped or cooked gooseberries before. Goodness, doesn’t topping and tailing them take time?! And I’d never made a cobbler before either. This wasn’t a bad first attempt, though there’s room for improvement: Worried the gooseberries were about to catch, I added a tablespoon of water to the pot, but not long after, the berries finally broke down a bit and dumped their liquid, so the finished fruit compote was a bit wet. Loosely referring to a few different recipes on the web, I estimated the amount of topping according to the volume of fruit. But as we used a pan that allowed them to spread out into a fairly thin layer, we could actually have done with a little more topping. It does expand on cooking, of course, as you can see from the photographs. Scale the compote and topping recipes up or down separately, as you think best. Preheat oven to 180 C (fan). Combine compote ingredients in a pan and cook until berries have broken down and softened a little and sugar is fully dissolved in the juices. Transfer to a suitable baking dish. 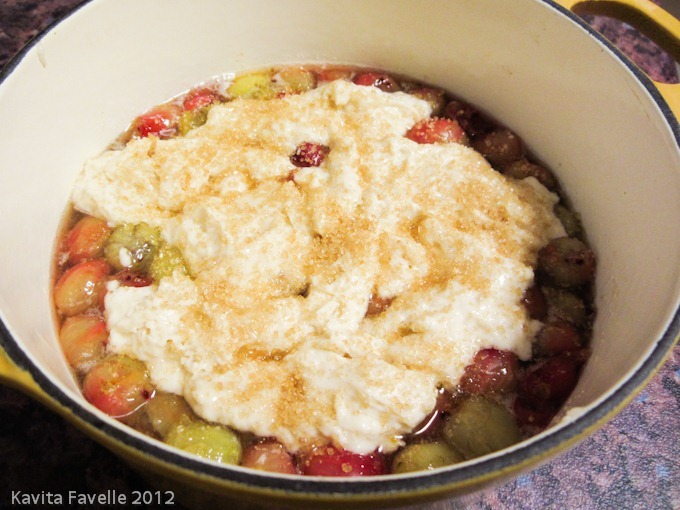 To make the cobbler topping, mix the flour, baking powder and salt into a bowl. Stir in one of the portions of sugar. 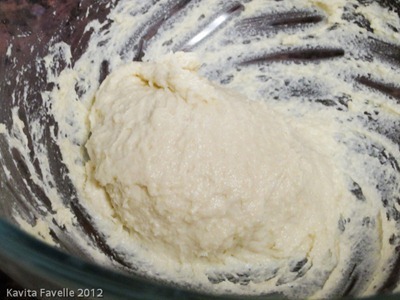 Add the buttermilk and mix into a dough. It’ll be pretty soft and sticky. 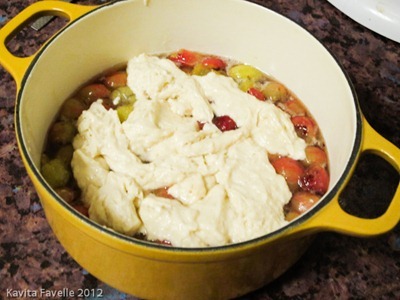 Gently drop spoonfuls of the dough onto the surface of the compote. Sprinkle the remaining sugar over the topping. Bake for about 25 minutes, until the cobbler topping is golden brown. 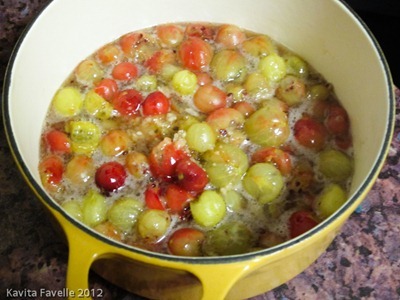 6 Comments to "Gooseberry Cobbler"
oh my god!!.. YES PLEASE!!! !… it looks stunning and what’s not to love… that tart/sweet think as your mouth goes swwwwwwwwooootch!.. love it! !… I never bother topping and tailing them, not worth it if you ask me! It did seem a lot of work, and there wasn’t much that I was taking off, so good to know you don’t bother. Thanks, Dom! Him Indoors loves Gooseberries too! Do you think it’s a guy thing? Anyway, you probably already know I’m a bit of a baking refusenik. Crumble is my limit. 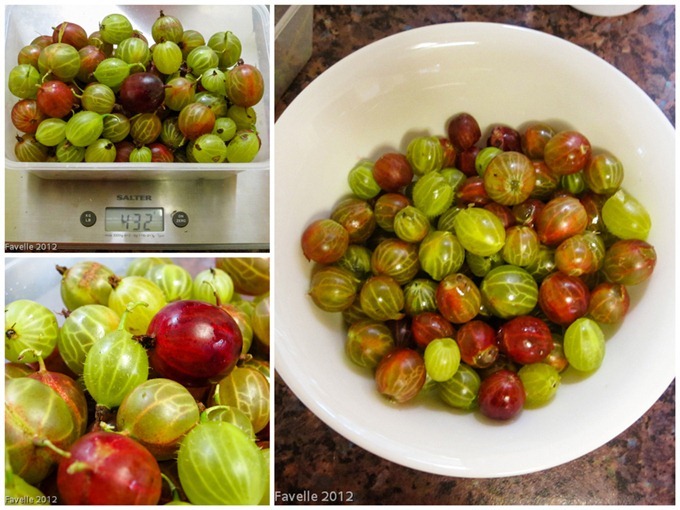 But now that Dominic has said I don’t need to bother topping and tailing the Gooseberries, I might give this a try. Thanks Kavey for another great idea! Yes, it definitely endears me more to these fruits! 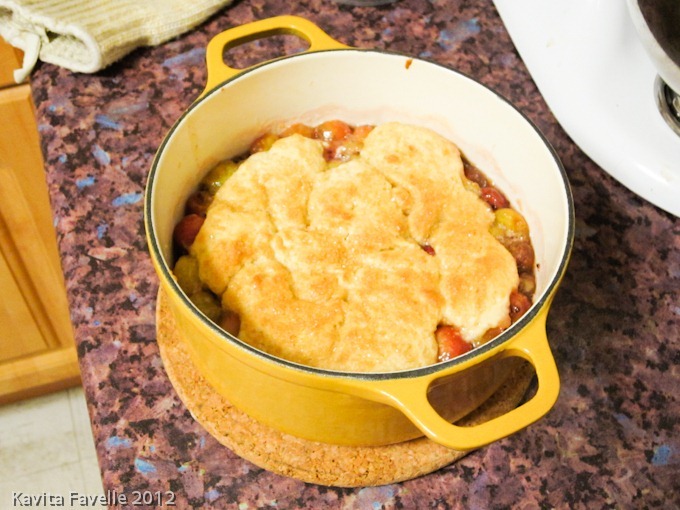 Cobbler is as easy as crumble, definitely worth a try. 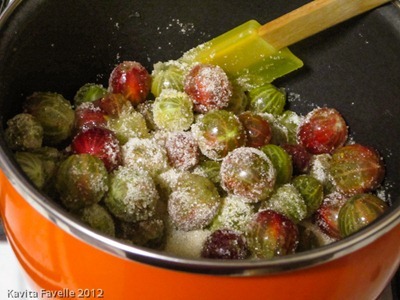 I’ve never had gooseberries before either, your cobbler looks beautiful!